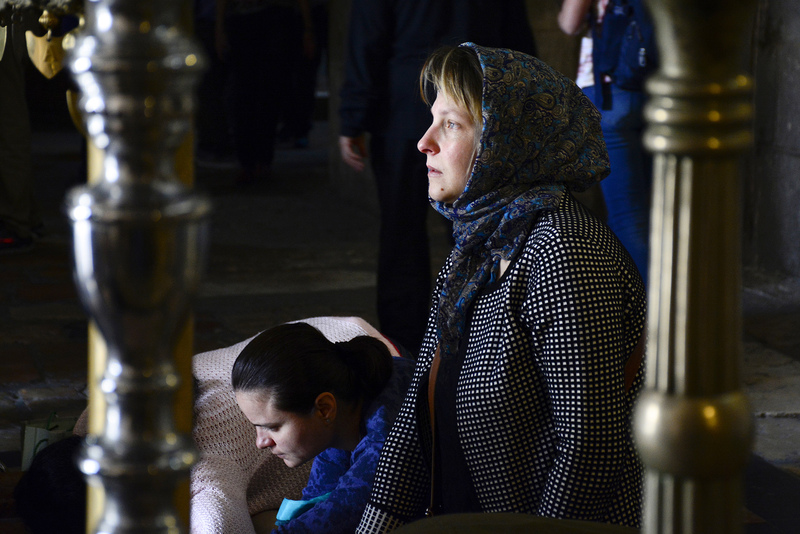 Kneeling on the stone floor Sunday, clutching a bundle of tissues, Gheorghe Viorica laid her other hand and forehead flat on the stone that, according to tradition, is where the body of Jesus Christ was prepared for burial. Many Christians believe The Church of the Holy Sepulchre, in Jerusalem’s Old City, is the site of Jesus’ crucifixion, death, burial and resurrection. The Stone of Anointing is one of many holy spots within its walls that brought Viorica from Italy to the Old City. Viorica knelt for nearly 20 minutes. She paused occasionally to sit up and stare into the distance as the hot Israeli sun streamed through the church’s entrance. Viorica was luckier than many Christian pilgrims who journeyed to Jerusalem earlier in the week. The church was closed for three days in protest of Israeli tax measures and proposed legislation and only reopened in the early morning hours on Feb. 28. The Times reported that the decision to reopen the large wooden doors of the holy site followed an announcement from the Prime Minister’s Office that the government would suspend the tax collection and pending legislation while the issue is reviewed by a newly formed committee. Filled with emotion after stepping away from the stone, Viorica struggled with her broken English to describe her visit to the church.